Monday November 26, 2018: Curtis and Jordan's wedding begins, Joss gets the truth out of Oscar, Ava and Ryan give into their feelings, and the Quartermaines' dinner is ruined again. 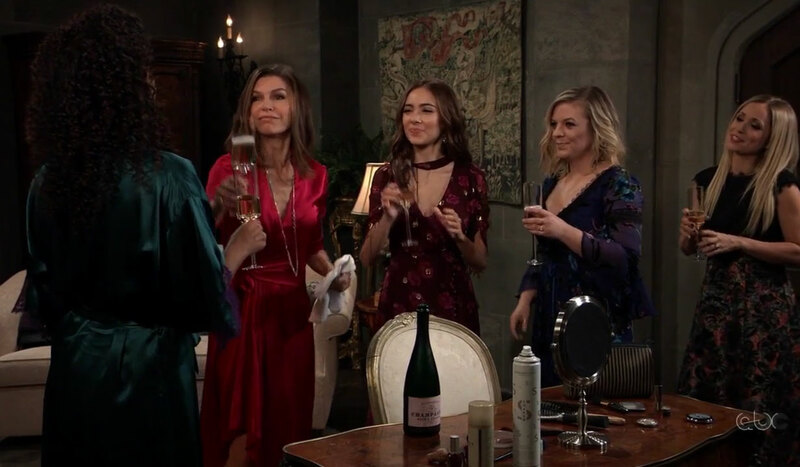 In the bridal room at the church, Anna, Molly, Maxie and Lulu toast to Jordan on her wedding day and partake in the something borrowed, something blue tradition. Lulu fails to bring something old, instead bringing something new, but Jordan assures them nothing will go wrong and she’s not a superstitious person. In the church, Curtis calls and leaves a message with Stella hoping she’ll change her mind and attend. Later, TJ speaks with Curtis and advises him not to dwell on Stella and focus on being happy with his mom. At the Quartermaine mansion, Monica has ordered pizza from a fancy gourmet restaurant rather than attempt a traditional dinner. Ned is shocked when Julian arrives for the celebration, but Olivia invited him because it means a lot to Leo. She also believes Julian is a changed man. Meanwhile, Monica informs Drew that she invited Oscar, and tried to get through to him about the immunotherapy. Elsewhere, Kim grabs Julian to remind him she’s running out of time to get Oscar into treatment. Julian made some calls, but thinks she needs to think long and hard about this. Drew spies on them as they talk. At the Cornithos place, Stella arrives, and Mike admits he was hoping she would have somewhere else to be today. Lucas and Brad appear with Wiley, and Brad is surprised that Michael isn’t with the Quartermaines. Michael is headed there later and picks up Wiley which makes Brad nervous. At Charlie’s, Joss confronts Oscar about his illness, and he confesses it’s true. He’s angry Joss’ boyfriend betrayed him and told her, but she reveals Cam was pretending to be her boyfriend to make him jealous. He admits it worked. He tells her about the brain tumor, and that he has a year left to live. There is a drug trial, but he is refusing to do it because there is a chance it will kill him quicker and he doesn’t want to spend the last months of his life a vegetable. She thinks he needs to look at the odds of the trial consequences more closely, because it seems if he does nothing he will for sure die. At Kiki’s, Kiki and Griffin dress for the wedding. Monica calls Griffin and informs him a decision has been made about his suspension and she can’t tell him over the phone, so copy is waiting for him at GH to read. Griffin suggests Kiki head to the church and he’ll meet her there after stopping at the hospital. Laura walks in on “Kevin” kissing Ava at the gallery and is furious. 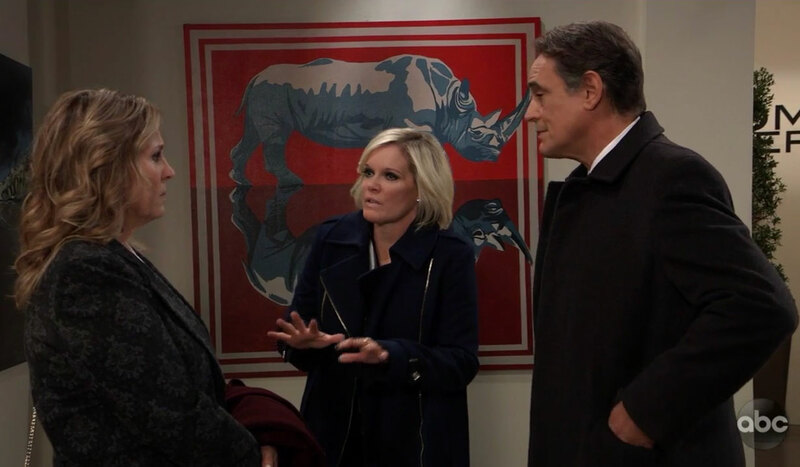 Ava assures Laura that she and “Kevin” aren’t having an affair. Laura cries that she can’t find any trace of the man she married when she looks into “Kevin’s” eyes and returns Ava’s campaign contribution because she won’t accept blood money. Laura storms out, and Ryan apologizes to Avs for Laura’s temper and being forward with the kiss. Ava liked the kiss and has felt something between them for a while. Ava suggests they spend Thanksgiving together. He is so glad she didn’t leave town, but Ava admits she may still have to leave because she can’t stand to be in the same town with Kiki. She suggests they go to her place, but Ryan offers to meet her there because he has some business to take care of. Back at the Quartermaine mansion, Drew confronts Kim and Julian about kidnapping his son. Julian never stated he was going to take Oscar and leaves them to talk. Drew warns Kim that kidnapping Oscar will likely cause him to pull away from her even more and lead to drastic consequences. Later, Kim confronts Julian after realizing he never planned to follow through and help her take Oscar. She feels she can’t count on him. Meanwhile, Monica, Ned and Olivia discover a man from the local food bank who came to pick up food they were donating also took their gourmet pizza dinner. Back at the Corinthos place, Sonny makes a Thanksgiving toast about how important family, which gets to Stella. Later, a teary-eyed Joss returns home and breaks down in her room. At the church, the wedding begins and TJ walks his mom down the aisle. As the priest asks if there is anyone who objects, Aunt Stella barges in. Michael arrives at the Quartermaines to find they ordered pizza from a local place after the gourmet dinner was mistakenly donated to a local shelter. Monica reminds them first they sing and then they eat. As they sing, the doorbell is run. Drew and Kim are surprised to find Oscar at the door. Back at Kiki’s, as she’s about to leave for the church she finds Ryan standing at her door with a hateful look in his eyes. Kim is furious with Julian for making a decision about Oscar. Carly advises Joss that this is Oscar’s choice to make. Griffin goes to Kiki’s place to check on her. At the church, Stella says she has to speak her peace.